The Cygnus supply ship is set for liftoff at 4:46 p.m. EDT (2046 GMT) Wednesday from launch pad 0A at the Mid-Atlantic Regional Spaceport, located at NASA’s Wallops Flight Facility on Virginia’s Eastern Shore. A two-stage Antares rocket will power the Cygnus spacecraft into orbit on the first leg of a journey to the space station set to conclude with the supply ship’s capture with the lab’s Canadian-built robotic arm around 5:30 a.m. EDT (0930 GMT) Friday. Northrop Grumman is the prime contractor on the Antares rocket and Cygnus spacecraft programs, and company officials said Tuesday that the mission set for launch Wednesday — the 11th Cygnus resupply flight under a $2.89 billion contract with NASA — will debut several new capabilities allowing the cargo craft to accommodate more science experiments, and potentially missions into deep space in support of NASA’s moon landing ambitions. A package of four control moment gyroscopes is installed aboard the Cygnus spacecraft for a demonstration after the supply ship completes its cargo delivery at the space station. Using momentum to manage the spacecraft’s pointing, or attitude, the four spinning gyroscopes will reduce the Cygnus spacecraft’s consumption of liquid propellants, which feed thrusters normally used to change the supply ship’s orientation. The innovation will allow the Cygnus spacecraft to remain in orbit for up to a year. Cygnus missions have previously lasted no more than three or four months. 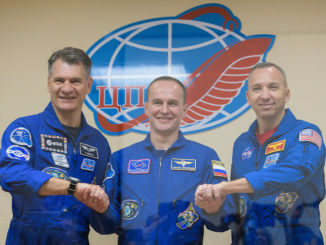 The extended mission will only begin after the Cygnus supply ship departs the space station in July, completing the spacecraft’s primary objective. The Cygnus mission, designated NG-11, will blast off with 7,575 pounds (3,436 kilograms) of cargo, including new flying robots that could help astronauts with chores on the space station, medical experiments, and 40 mice to be studied by astronauts and researchers to examine how their immune systems cope with the conditions of spaceflight. Powered by two kerosene-fueled Russian RD-181 main engines and a U.S.-built solid-fueled Castor 30XL upper stage, the Antares rocket will place the Cygnus spacecraft into orbit around nine minutes after liftoff, kicking off the freighter’s pursuit of the space station. After Friday’s arrival, the station crew will unpack around 6,971 pounds (3,162 kilograms) of food, crew provisions and science experiments from the Cygnus spacecraft’s pressurized cargo module, built by Thales Alenia Space in Italy, then repack the ship with trash before its departure in late July. After release from the station’s robotic arm, the cargo craft will boost itself into a higher orbit for deployment of several CubeSats, similar to maneuvers accomplished by previous Cygnus missions. But instead of commanding the spacecraft to plunge back into the atmosphere for a destructive re-entry, Northrop Grumman ground controllers will begin the extended mission experiment. “We’ll use the control moment gyros to control the spacecraft attitude, as opposed to fuel,” said Frank DeMauro, vice president and general manager of Northrop Grumman’s space systems division. Northrop Grumman officials previously said the extended mission demo could last a year, but DeMauro said the mission’s duration will depend on when engineers accomplish all their objectives. “How long we go really will depend on when we achieve our goals for the extended mission (demonstration),” DeMauro said. “We want to accomplish a couple of things,” he said. “First, we want to show how the spacecraft works with the CMGs (control moment gyroscopes) and demonstrate that our platform can use CMGs — not only our platform but other Northrop Grumman spacecraft platforms. The control moment gyroscopes were built by Honeywell, using new miniaturized technology that could be used on future small satellites. Northrop Grumman wants to keep the NG-11 Cygnus spacecraft in orbit through the launch of the company’s next resupply mission to the space station, designated NG-12, currently scheduled for October. Officials want to offer the Cygnus spacecraft as a hosting platform for science and technology experiments after it leaves the space station. DeMauro said the Cygnus spacecraft provides a smooth microgravity environment for research in orbit, even better than the space station, which has disturbances from the movement of crew members and other external influences. The use of gyroscopes will make for more pristine microgravity conditions, eliminating impulses from thruster firings to change the ship’s orientation. Like past Cygnus missions, the spacecraft will re-enter the atmosphere and burn up over the Pacific Ocean once the extended duration demonstration is complete. The NG-11 mission is the last Cygnus flight under Northrop Grumman’s first cargo transportation contract with NASA, a deal originally signed in 2008. 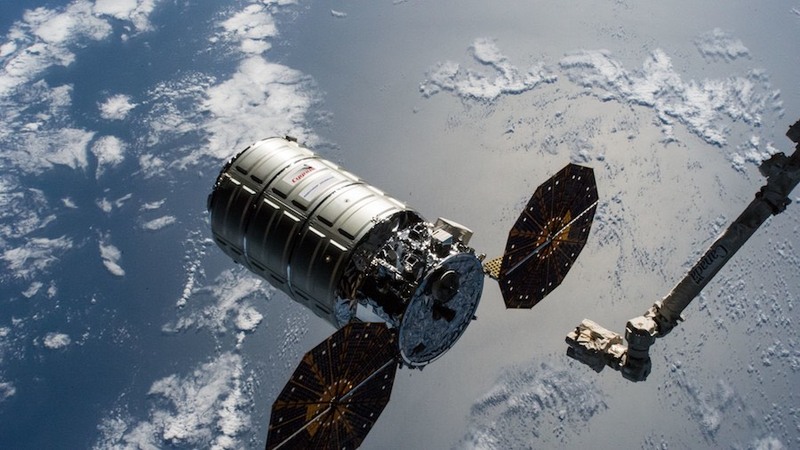 The company has a follow-on Commercial Resupply Services, or CRS-2, contract for at least six additional Cygnus missions through 2024, beginning with the NG-12 mission later this year. “Our push is to offer NASA increased science capability on each mission,” DeMauro said. For the first time, ground teams at Wallops planned to load time-sensitive cargo into the Cygnus spacecraft at the launch pad Tuesday night, less than 24 hours before liftoff. 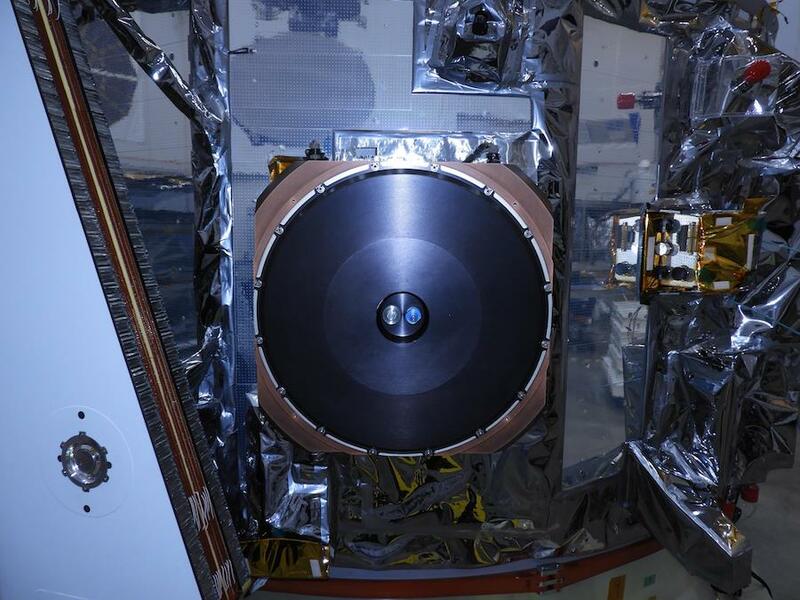 Northrop Grumman developed a new mobile clean room to be positioned over the Antares rocket’s payload shroud, with the launcher lowered back to a horizontal position following preliminary pre-launch checkouts. Technicians removed the top of the payload fairing, known as the “pop-top,” and opened the Cygnus hatch to allow teams to load the enclosure containing the rodent research experiment. The NG-11 mission marks the first time a rodent research payload has flown aboard a Cygnus supply ship, following multiple missions on SpaceX’s Dragon cargo capsule. The NG-11 mission will also debut a new navigation system on the Antares rocket, ahead of additional launcher upgrades coming with the first CRS-2 mission later this year. Engineers will beef up the Antares rocket’s structure for the next mission to allow the first stage’s twin RD-181 engines to fly at full throttle as the launcher flies through the most extreme period of aerodynamic pressure, or Max-Q, after liftoff. 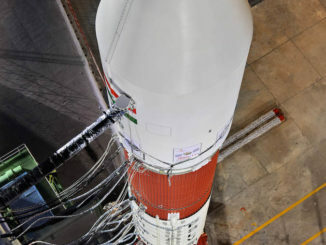 The engines are currently throttled back to around 55 percent power to ease the passage through Max-Q. Northrop Grumman is also removing some unnecessary insulation from the Castor 30XL upper stage, and switching from a three-piece fairing adapter to a lighter structure. Future Antares rockets will also fly with two fewer helium pressurization bottles in the first stage, hardware that data from previous launches indicated was not required. 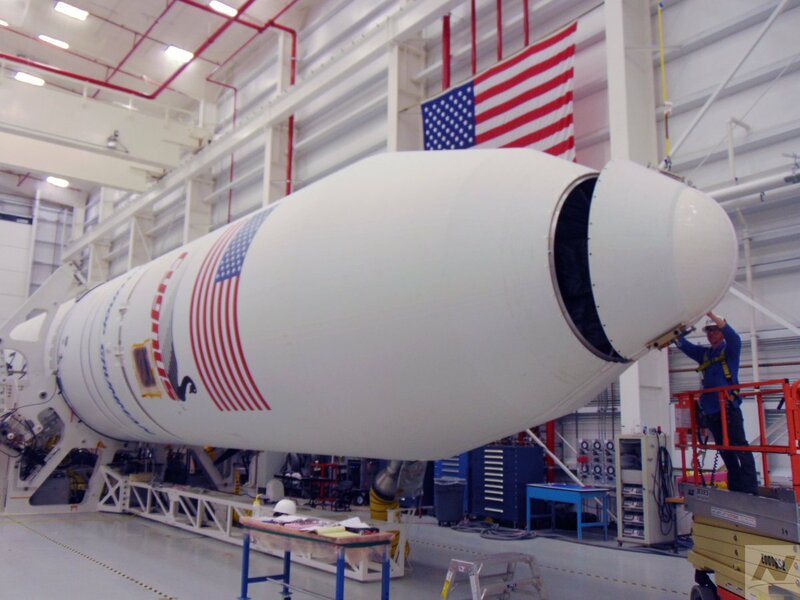 The changes will increase the mass of payloads the Antares rocket can loft into orbit. The Cygnus team has taken a step-by-step approach with upgrades since the spacecraft’s inaugural mission. Since the Antares rocket and Cygnus spacecraft’s first missions in 2013, engineers from Northrop Grumman Innovation Systems — previously known as Orbital Sciences and Orbital ATK — have introduced a larger Thales-built cargo module and debuted new RD-181 engines for the Antares first stage. Officials replaced the Antares rocket’s original AJ26 first stage engines after one of the powerplants failed on a 2014 launch, destroying a Cygnus spacecraft heading for the space station and damaging the launch pad at Wallops Island. 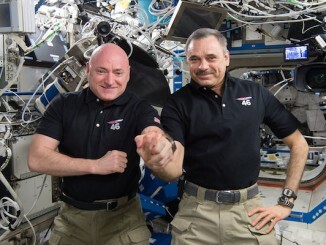 DeMauro said the expanded performance and longer lifetime of the newest generation of Cygnus supply ships positions the spacecraft for more demanding missions in the future, including flights into deep space to support NASA’s plans to build a mini-space station called the Gateway in lunar orbit, with a goal set by the Trump administration of landing astronauts on the moon as soon as 2024. 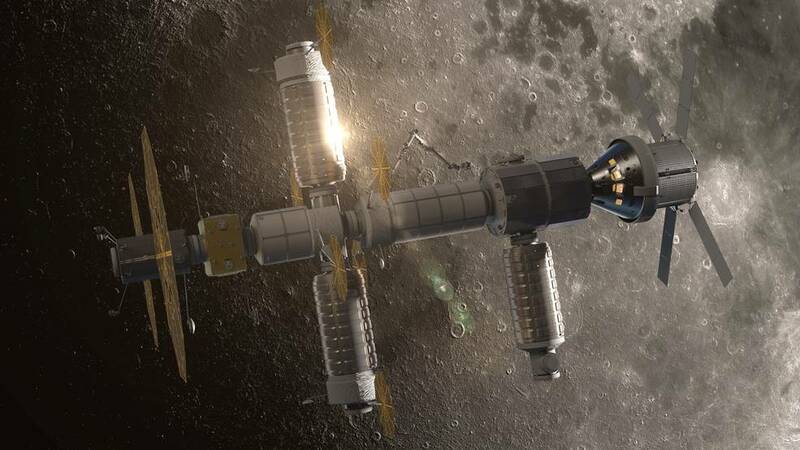 Northrop Grumman has a NASA contract to develop a habitat concept based on the Cygnus design, which could be attached to NASA’s Gateway around the moon to provide living quarters for astronauts. Lunar landers could be staged at the Gateway for trips to and from the moon’s surface. “We think we’re in a good place to offer NASA a proven, yet upgraded technology suite on a Cygnus-class vehicle to provide all sorts of services out in cislunar space, whether it’s habitats, logistics services, science and utilization services, as well as even power and propulsion systems out there. Cygnus is a stepping stone from that point of view,” DeMauro said. The Cygnus spacecraft set for launch Wednesday is named the “S.S. Roger Chaffee” after the late astronaut who perished in the Apollo 1 fire at Cape Canaveral in 1967. Members of the Chaffee family will attend Wednesday’s launch from Wallops Island. “That’s just something that makes this extra special, so we’re looking forward to seeing them here,” DeMauro said.